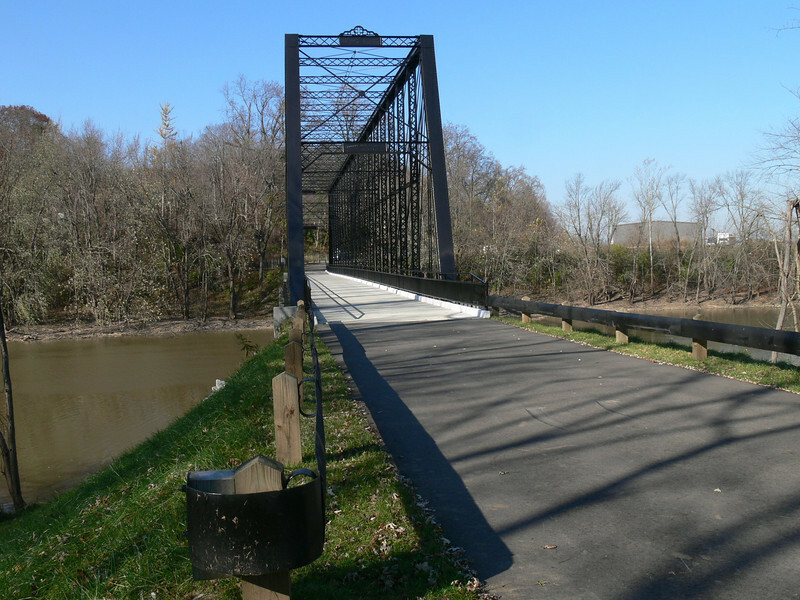 In Aurora, Indiana just south of Lawrenceburg, lies a one-of-a-kind Triple Whipple Bridge. The only known Triple Whipple or Triple Intersection Pratt Truss in existence in the United States has a long history earning it a place on the National Register of Historic Places. The bridge was originally built by the Wrought Iron Bridge Company of Canton, Ohio and was one of the largest bridges at the time of it design. The Trusses stand 40 feet tall and stretch 300 feet across the Laughery Creek. The bridge was built in 1878 on stone abutments from 1867. Work began in April of 2008 to rehabilitate the bridge. $1.32 million in Transportation Enhancement funding was matched by $329,000 in local funds to address the bridges deficiencies. The project included cleaning and painting the cast and wrought iron truss structure, replacement of pole railing, the clearing of overgrown vegetation, and the repair of the original stone abutments. In addition, parking lots were added at each end of the bridge for visitor parking. The project was completed in the spring of 2009 by the Faulkner Construction company from Louisville, Kentucky.